Astronomers using the National Science Foundation's (NSF) newly commissioned Robert C. Byrd Green Bank Telescope (GBT) have detected remarkably faint radio signals from an 820 year-old pulsar, making it the youngest radio-emitting pulsar known. This discovery pushes the boundaries of radio telescope sensitivity for discovering pulsars, and will enable scientists to conduct observations that could lead to a better understanding of how these stars evolve. "Important questions about pulsars may be answered by long-term monitoring of objects such as the one we just detected," said Fernando Camilo of Columbia University in New York City. "Young pulsars are particularly rare, and being able to study such a young one at radio wavelengths provides an outstanding opportunity to learn critical facts about their evolution and workings." The results of this research, based on observations conducted on February 22-23, 2002, were accepted for publication in the Astrophysical Journal Letters. Scientists have long suspected that a pulsar - a rapidly spinning, superdense neutron star - was born when a giant star ended its life in a cataclysmic supernova explosion observed in late summer of 1181, as suggested by Japanese and Chinese historical records. For the past 20 years, astronomers have searched this supernova remnant (3C58), located 10,000 light-years away in the constellation Cassiopeia, for the telltale pulsations of a newly born pulsar. Late in 2001, data from NASA's Chandra X-ray satellite confirmed its existence, but it remained an elusive quarry for radio telescopes. "We believed from historical records and certainly knew from recent X-ray observations that this star was there," Camilo remarked, "but despite many attempts, no one had been able to find any radio pulsations from it because the signals are, it turns out, incredibly weak." For comparison, this pulsar's radio emission is some 250 times weaker than that from the famous pulsar in the Crab Nebula (the remnant of an explosion in the year 1054 recorded by Chinese astronomers and possibly also by Native Americans of the Anasazi tribe in modern-day Arizona and New Mexico). "Although we knew what we were looking for," said Camilo "it took the new Green Bank Telescope with its unmatched sensitivity -- and, importantly, location in the National Radio Quiet Zone -- to make this remarkable detection." A pulsar is formed when a massive star runs out of nuclear fuel and dies in a cataclysmic explosion called a supernova. The outer layers of the star are blown off into space, and are often seen as an expanding remnant shell of hot gas. The core of the star, with 40 percent more mass than our Sun, collapses under its own gravity to a sphere only about 10 miles in diameter, composed mostly of neutrons. These densest objects known in the Universe typically are born spinning very rapidly; the newly detected pulsar, known as PSR J0205+6449, presently rotates 15 times every second. Pulsar Diagram: Click on image for more detail. 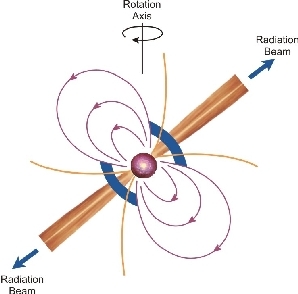 The spinning neutron star has very powerful magnetic and electric fields that accelerate electrons and other subatomic particles, causing them to emit beams of radio waves, X-rays, and other forms of radiation. If these beams intersect the Earth as the star rotates, we can then detect the pulsar, as it appears to flash on-and-off, much like a lighthouse. As the pulsar ages, it gradually slows down and loses its rotational energy. After a few million years it is no longer powerful enough to generate radio emission and "turns-off." By detecting this pulsar in the radio spectrum, astronomers may now follow its evolution with greater ease and flexibility than with X-ray telescopes on satellites, study the pulsar emission mechanisms, and also characterize the dynamic interstellar medium between the Earth and the pulsar. "Finding a radio pulsar this young could be somewhat of a gold mine for years to come," noted Camilo. "We can very precisely measure how its rate of rotation changes over time, potentially inferring fundamental clues about what causes a magnetized neutron star to spin down. We also will make valuable comparisons to the X-ray data, which may help us determine exactly how these objects generate and emit radiation." The researchers also point to the fact that this discovery bodes well for the GBT being able to study additional young pulsars that have previously escaped detection. "By using this magnificent new telescope, we should be able to discover other very young pulsars that we surmise are there, but are simply too weak to detect by any other means," said Camilo. "Measuring the luminosity and spectrum of a large sample of these stars will be crucial for making an accurate census of pulsars in our Galaxy." The researchers used the new Berkeley-Caltech Pulsar Machine to process the signals from the GBT and record them for later analysis. The group led by Camilo in this investigation consists also of: Ingrid H. Stairs (NRAO Green Bank, West Virginia); Duncan R. Lorimer, Michael Kramer, Maura A. McLaughlin (University of Manchester, Jodrell Bank Observatory, Cheshire, U.K.); Donald C. Backer (University of California, Berkeley); Scott M. Ransom (McGill University, Montreal, Canada); Bernd Klein, Richard Wielebinski, Peter Muller (Max-Planck-Institut fur Radioastronomie, Bonn, Germany); and Zaven Arzoumanian (Universities Space Research Association/NASA-Goddard Space Flight Center, Greenbelt, Maryland). 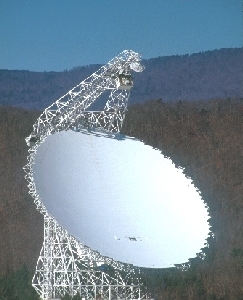 The GBT is the world's largest fully steerable radio telescope. It was dedicated on August 25, 2000.